When we don’t have time for God, it’s difficult to have a meaningful conversation or relationship with Him. The busyness of life may keep you from hearing God’s voice. Satan loves to fill up our lives, even with good, godly acts of service, so that we don’t have time to listen to God’s voice. The enemy keeps us in chaos and noise so that we cannot hear the still, small voice of Jesus. Are you too busy serving in too many places, so you miss out on what He says to you? Or do you make time regularly to sit alone with the Lord, listening to His Spirit within you? He does have something to say to you. Remember Mary and Martha? Martha opened her home to Jesus. All her preparations for His visit robbed her of spending time with her Guest of honor, while Mary sat at Jesus’ feet and eagerly listened to what He said. Are you too busy doing, doing, doing to sit at the feet of Jesus and listen to what He wants to say to you? It pleased Jesus that Mary sat and listened to Him, and He didn’t take that time away from her. Everything else could wait. I must confess, my innate tendency is to behave more like Martha than Mary. Being the die-hard people-pleaser that I am, if Jesus and His disciples came to visit my home, I might be more worried about the hospitality than the relationality. I could see myself scurrying around, cleaning, preparing a meal, and making sure my guests are well taken care of. I would be more inclined to “do” than to “be” still and listen. Understanding my nature and God-given spiritual gift of help or service, I must force myself to be more social and relational when hosting a gathering. My efforts are usually concentrated on fulfilling the roles of maid, cook, caterer, server, dishwasher, launderer, and concierge, rather than playing the warm, welcoming, congenial hostess role. I’m afraid I would be more concerned about making sure Jesus had a clean, comfortable place to sit, a nice meal to eat, a tasty wine to drink, and crisp, clean sheets to sleep on than on honoring Him with my undivided time, listening to every word that rolled out of His mouth. Opposites attract, however. My husband is a popular, sanguine Mary. He walks into a crowded room and immediately bursts with positive energy from being in a social atmosphere. He loves communicating with anyone and everyone. He enjoys initiating and carrying on conversations with complete strangers. A social gathering is very exciting and emotionally stimulating for him. He talks and listens to each guest who enters our home, making them feel special and welcome. My husband would shake Jesus’s hand and cheerfully sit at His feet, listening to every word He spoke. Whose behavior do you think Jesus would most appreciate? Are you a Martha or a Mary? When Martha told Jesus to reprimand Mary for not helping her with the preparations, Jesus very clearly set Martha straight on her priorities. We have to find a balance between serving and spending time alone with Christ, listening to His voice. Is Jesus pleased with the amount of individual attention you give Him? Are you making your time with Him a priority over your other activities? #1: I don’t have time to wait for God to speak to me. 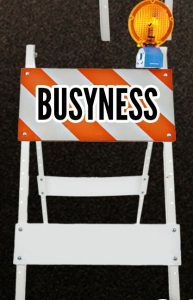 #2: All these other activities I do are more urgent than spending time with God. #3: Investing time in godly activities equals having a relationship with Jesus. 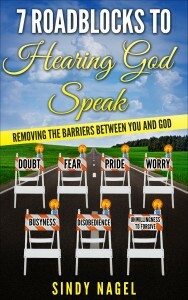 Click on the link below to purchase your copy of 7 Roadblocks to Hearing God Speak. Identify the obstacles and the lies that hinder your communication with the Holy Spirit, and then, make an effort to remove and disprove them. This book will get you started in the right direction. Click here to Purchase the book now. Great things come in threes. God gives Christ followers many awesome gifts, too numerous to mention here, but the greatest are these three: 1) God the Father, 2) Jesus the Son, and 3) God the Holy Spirit—a.k.a. the Trinitarian, Three-In-One God. God, the Father, sent His One and Only Son, Jesus Christ, to earth to: 1) be born of a virgin, 2) walk the earth in the flesh as a man, and 3) die on the cross as a sacrificial lamb of atonement for the sins of all people. Jesus was buried in a borrowed tomb. He descended into hell to bear the punishment for all our sins. Three days later, God: 1) raised Jesus from the dead, 2) seated Him next to Himself at His right hand, and 3) placed all things under His feet, appointing Jesus to be head over everything (Eph. 1:22). Again, the number three triumphs. The wise men from the east bowed down and worshiped the Christ child. They presented Him with three treasured gifts: 1) gold, 2) incense, and 3) myrrh. 3) tithes, offerings, and service? Whatever you decide, you can’t out-give God. He already demonstrated the great depth of His love for you by giving the ultimate gift—the birth and death of His Son, Jesus Christ, as payment for your sin. Perhaps you could honor the Christ child today with these three gifts: 1) your time, 2) your attentiveness, and 3) your discerning ears. 1) Make TIME to BE STILL with God today. 2) Escape the crowds and noise, and FOCUS your attention on Him only. 3) LISTEN to the still, small voice of the Holy Spirit within. God loves you more than you will ever comprehend. He wants to spend time with you, showing you and telling you. In your quiet time with Jesus today, bow down and worship the King on His birthday. 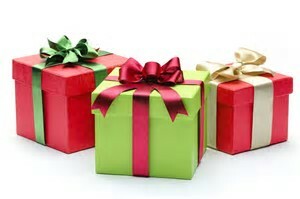 Present Him with your three gifts: 1) time, 2) attentiveness, and 3) listening ears. It is better to give AND receive JESUS. My three gifts to God and you today are three FREE Kindle books, 1) Manna for Today, 2) 7 Simple Steps to Hearing God’s Voice, and 3) 7 Roadblocks to Hearing God Speak. Download your three FREE Kindle books today, in honor of Jesus Christ, my King. This entry was posted on December 25, 2016, in From God's Heart to Yours, General messages from Sindy and tagged attentiveness, Christmas, ears, focus, gifts, glory, God, Holy Spirit, Jesus, king, listening, love, magi, obedience, offerings, praise, service, star, three, time, tithes, trust, worship.